Archibald Cameron was a son of Archibald Cameron and Jessie Robina Cameron and was born at Branxholme in 1891. Mabel Mary was born the year before at Branxholme and a brother Sidney Hugh was born at Hawkesdale in 1894. Archibald Cameron Sr owned pastoral land around Branxholme and Mt. Napier and was a Dundas Shire Councillor and the family lived at Fleetwood in South Hamilton. Archibald Jr attended Hamilton College and was a member of the College cadets for six years and was a member of the Hamilton Rifle Club. When he finished school, Archibald worked as a clerk. On 2 August 1915, Archibald enlisted in Melbourne. The photo above shows Archibald Douglas Cameron and an unidentified soldier, however, it is unknown which was which. 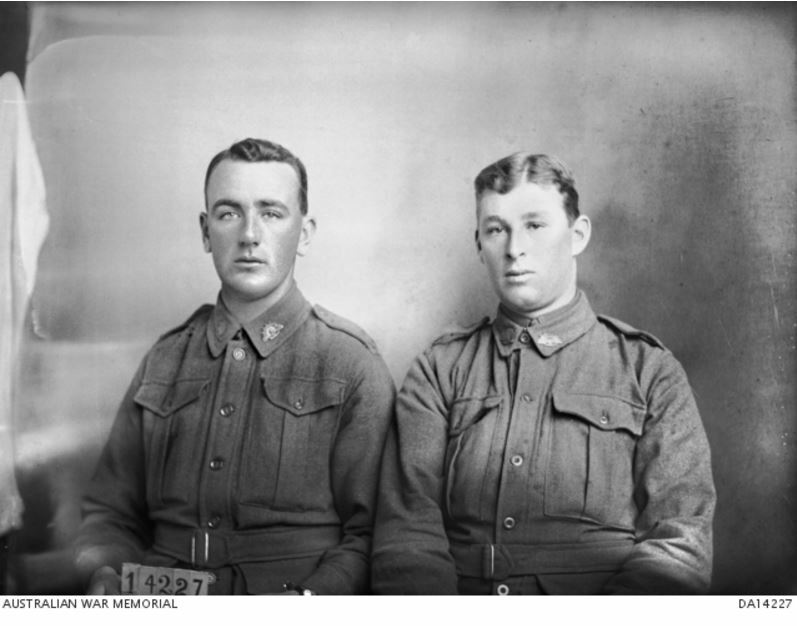 The doctor at Archibald’s medical examination in Melbourne described him as having brown hair and a ruddy complexion suggesting Archibald is the soldier on the left. However, when Hamilton Doctor Eric Norham Scott examined Archibald on the 6 July 1915, he described him having a fair complexion. Both agreed on Archibald’s blue eyes. 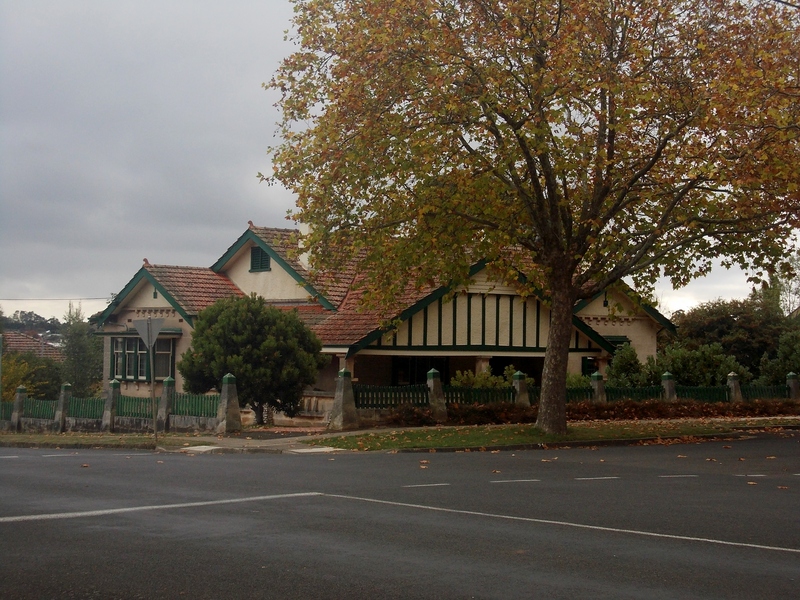 Initially, Archibald was with the 21st Depot Battalion in Warrnambool from 8 September 1915. That may have given him the opportunity for leave to attend his sister Mabel’s wedding on 20 October, when she married Lionel Learmonth, son of Harold Learmonth of The Gables, Hamilton. In the new year, Archibald was transferred to Broadmeadows on 13 January 1916 and departed Australia on 14 March. Once in Alexandria, Archibald joined the newly formed 46th Battalion and left for France, reaching Etaples by 21 July 1916. The 46th Battalion faced its first major battle on 4 August at Pozieres. At home, Sidney had received an enlistment exemption during November 1916 on the basis that one son, Archibald, had enlisted leaving just one son at home. Archibald meanwhile was facing a cold winter rotating in and out of the front line trenches. In the spring, the 46th Battalion was a part of the Battle of Bullecourt on 11 April 1917. During July 1917, Archibald fell ill with pleurisy and by the end of the month was a patient in the City of London hospital. He rejoined his battalion in France on 18 November 1917. Throughout the winter, the 48th Battalion again rotated on and off the front line before the German Spring Offensive. On 27 August 1918, Jessie Cameron planted a tree for Archibald along the Clarke Street Memorial Avenue but the war was almost over and Archibald had safely reached the end. He returned to Australia on 13 April 1919. In 1924, Archibald Cameron Sr had a fine Californian Bungalow built on the corner of Gray and McIntyre Streets and called it Fleetwood. It is unclear if the Cameron’s former home of Fleetwood was on the same site. Archibald Sr did not have long to enjoy his new home as he died in 1925. Archibald Jr and his brother Sidney never married and they continued to live at Fleetwood until their deaths, Archibald in 1975 and Sidney in 1978. Archibald Douglas Cameron is buried at the Hamilton Lawn Cemetery. Their mother Jessie also lived at Fleetwood until her death in 1942 and sister Mabel, widowed in 1934, lived across the road in the next block down in McIntyre Street.